NAM ĐỊNH — Two drug traffickers were arrested and 19 varieties of synthetic drugs were recently seized in Nam Định Province, the province’s police said on Wednesday. This information was reported by the Lao Động (Labour) newspaper. The province’s drug crime investigation sub-department (PC47) on March 29 uncovered a drug trafficking ring operating from a four-storey house located along National Route 10 in Ý Yên District. Trương Đức Hưng, 43, the ring’s leader, was caught red-handed selling some 300g of synthetic drugs and 300 tablets of ecstasy to other drug addicts. Several other types of drugs, including Methamphetamine, crystal meth and American weed that were divided into small packets, were confiscated. Hưng, a resident of the district, was reportedly a drug addict and had indulged in illicit acts for years, the police said. He would gather drug addicts at the house and used them to sell drugs. The house was equipped with folding doors, metal mesh fences and a security camera system, the police reported. All activities related to the sale of drugs were conducted through a small door. Nguyễn Thế Hùng, 40, resident of Hải Phòng City, was caught following the police’s interrogation of Hưng. He had with him some 800g of crystal meth, 700 tablets of ecstasy and some VNĐ5 million (US$220) of drugs money. 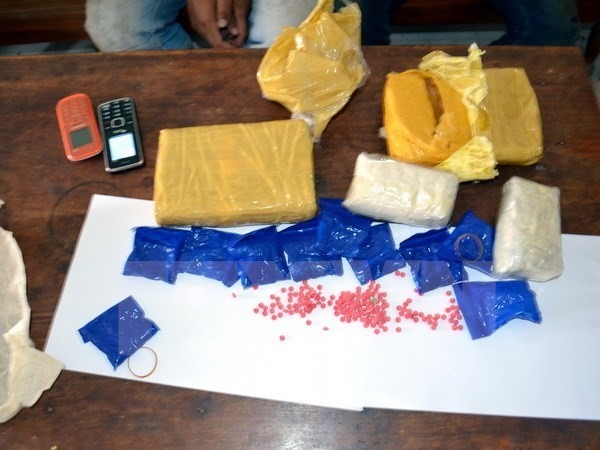 Earlier on Tuesday, a 23-year-old drug trafficker carrying 5kg of drugs was caught in Thanh Hóa Province, the provincial Border Guard Command said on Wednesday. Vi Thạo Thiều, resident of Houaphanh Province in Laos, admitted to transporting the drugs to sell to drug addicts in Thanh Hóa Province’s Mường Lát District, the police said. Investigation revealed that he connected with other drug addicts to transport drugs from Laos to Việt Nam via trails near the border at nightfall.